46 | November - December 2015 | www.machinerylubrication.com By Suz y HitcHcock, icml The impact of improper lubrica- tion in equipment failure should be of no surprise to Machinery Lubrication readers, yet lubrication depart- ments are not always highly regarded within a maintenance organization. Why? Many personnel do not understand the risks associated with the different jobs. People still do not realize that the lubrication tech- nician is more likely to cause equipment failure when compared to others working with the machine. Certain mistakes may lead to failure, but incorrect lubrication will cause failure sooner or later. For the value of a lube tech to be recog- nized, it is important to understand the cost of failure, because cost is the ultimate voice for buy-in. From operators to managers, everyone understands and speaks dollars and cents. Unless there is broad spectrum buy-in, change can never be successful. After analyzing the cause of each failure, it is possible to segregate the failures into groups and identify the criticality of each activity. You must also consider the impact of the human role in each failure group before determining the cost and worth of the human elements of reliability. Cost of Poor Lubrication A plant in New Zealand recently esti- mated its cost of failures to be $5 million. Some 80 percent of the failing assets had lubricant-related issues, meaning poor lubrication was a contributing factor to potentially $4 million of the estimate. 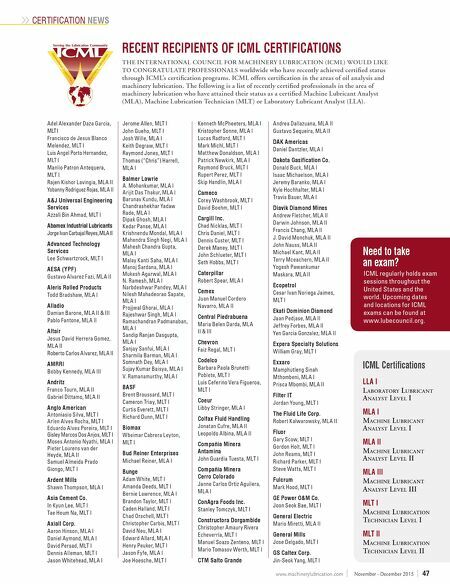 Real- izing the direct and significant impact of human failure in improper lubrication, virtually 100 percent of this potential $4 million could be attributed to mistakes made by lube techs, such as incorrect lubes, leaks, empty lubrica- tors, blocked filters and contamination. This is why it's critical for everyone in the organization to understand the role each technician plays in causing failures. It is also essential to consider that the human cause for failure was more than likely due to a lack of proper processes, procedures, systems and, most of all, technical knowledge. After the plant determined that lube techs could contribute to costs of $4 million in a year, how much do you think the main- tenance engineer cost the plant in failures? Close to zero is a good estimate. Now think in terms of investing in these two individ- uals. Would you think the lube tech is being trained and educated at a ratio of four million to zero when compared to the main- tenance engineer? Training is normally viewed as a cost to the organization. Therefore, perceived role criticality determines who gets trained. If considering the budget in most organiza- tions, it is likely that analysis of the cost of failure vs. job title will point to the techni- cians having a more direct impact (criticality) in total cost of failures than other (more highly regarded) positions. Importance of Training When you don't know how much the lack of knowledge costs your company, training will be viewed as a cost. Once you realize that it was likely the lube tech's lack of knowledge that caused the improper lubrication, which was potentially respon- sible for 80 percent of the costs related to failures, training improves from a cost to an investment. It also becomes clear who should receive this training. Without any harm intended toward maintenance engineers or managers, if reli- ability relates to avoiding failure, and failure has been proven to be caused by the techni- cian, wouldn't it make more sense in terms of the return on investment to allocate more money to training and qualifying the people who actually cause the failures? Of course, the road to improvement doesn't stop there. After training and quali- fying lube techs, organizations still have many changes to make before they can happily say their lube techs are no longer taken for granted or "walking liabilities" to the equipment. 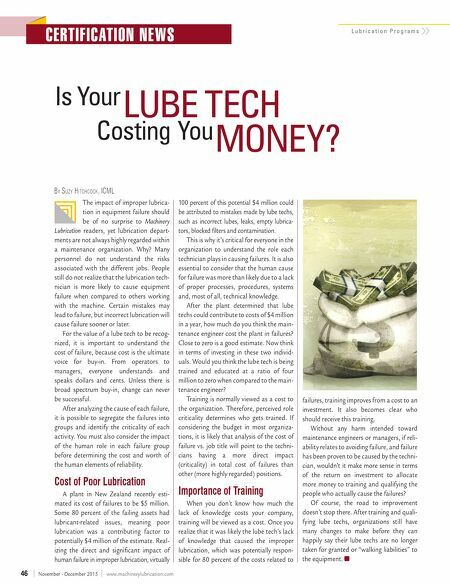 CER TIFICATION NEWS L u b r i c a t i o n P r o g r a m s Is Your LUBE TECH Costing You MONEY?